Mommy, Esq. : Holidays - Here They Come! I'm finally getting into the Christmas Spirit (maybe it was the 7 hrs they slept last night?). I'm taking a break from wrapping and watching Love Actually. Next up is making Spinach and Artichoke Dip for Christmas Eve (with my dad's side of the family) and Christmas Day (with my mom's side of the family). Finally on to packing - I can't believe the amount of kid stuff I need to pack for ONE NIGHT - toys, playmat, bottles, formula, breastmilk, pump, clothes, swaddle blankets, sleep sacks, diapers, wipes, pacifiers...the list goes on and on. Plus everyone has given them "special" Christmas outfits so I think costume changes are in order during the next 48 hours. 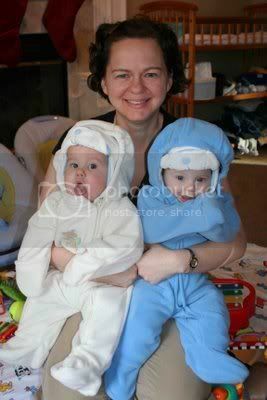 Here is a preview of the kids wearing one such outfit. Not enough that I took photos in these clothes for Mimi (my grandmother) - now she wants the kids posed wearing them under the tree! We'll see what we can do. Penny is still not eating very well (I think it has been more than a month) so we're starting her on Prilosec to see if it will help. I still don't think she has acid reflux but I've been tearing my hair out trying to get her to eat more than 3 ounces a feeding and it is leaving us both in tears. We always try to cram so many memories into a few short days but I am looking forward to seeing my preggers sisters and my nephew and the whole extended family. I will do my best to manage my expectation of memories and the tykes' behavior. I should be able to post on or before Christmas so I'll save my "Happy Holidays" until then. Cheers! OMG, could they be any cuter with their outfits and their huge grins?! What was the photographer doing to get them both to smile so beautifully at the same time!? Kuddos! Awesome photo!!!!! Love the Christmas outfits too! i cannot get over how much they love getting their photos taken. so precious. CUTE photos of the babes! We never got Alex to eat more than 3-4 oz at a time. We had to keep offering him a bottle over the course of an hour. When they started day care, he magically would have 6 oz at a time and we asked how they did it. They offered him the bottle over the course of an hour too.